Sorry for the delay. I have been fighting a killer sinus infection and hosting a lovely group of ladies for brunch. Now, to give away our copy of A Sane Women's Guide to Raising a Large Family . Someone noticed how many mothers would be blessed by this book and offered to buy an additional 2 copies to give away! Latrice, thank you for your encouraging words and generous heart! 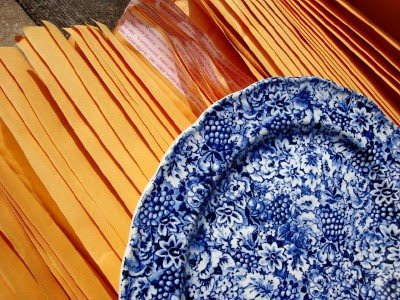 Just in time for mailing, I found a giant stack of padded envelopes at a yard sale this morning (10-cents each) and another blue platter for $2. Thank you to everyone who entered and shared your thoughts on families and frugality! My son has a sinus infection and he's had to come home from work early yesterday and today (which are the ONLY two days he works this semester!). I don't think our sinus passages like this up and down weather. Do those pretty dishes have be washed by hand or is your dishwasher broken? I hope you are feeling better and that you have a working dishwasher! Congratulations to all the blessed ladies who won the book. I hope you enjoy every wonderful word. 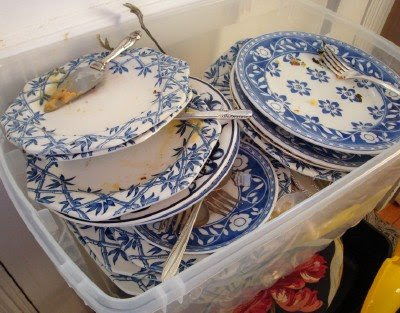 I was just thinking the other day that I should ask you how you like using the tb for dirty dishes instead of piling them in the sink (love those dishes!, by the way) - I see you're stillhandling party dishes that way, so it must work pretty well. Do you have a spot to keep it out of the way? Congrats to all the winners! Your pic is making me want to dig my mother's old blue dishes out of the garage! Gorgeous!!!!! I thought about you several times yesterday - I missed being able to be with you at the brunch!! I hope today's sunny weather will help you turn the corner with your sinus infection! YAYYYYYYYYYYYYYYY! This site is filled with blessings! Just returning from SPRINNNNG BREAK! Finding mostly 'free and educational' things to do in Seattle - with the exception of a first time treat for the whole fam - THE CHEESECAKE FACTORY! All I need in your ' mailing 'desination ' and the amount - and the money is in the mail!!! You are such a blessing to all of us, sister meredith!